Ever wonder why there are no garden tours in February? Of course you haven't. The answer is painfully obvious: at this time of year the average Northwest garden is bleak, disheveled and damp. If your garden is anything like mine, the perennials are moldering mush-heaps, the roses are prickly sticks, and the ornamental grasses are having nothing but bad hair days. Except for a few hardy blossoms, my herbaceous borders are florally bankrupt. 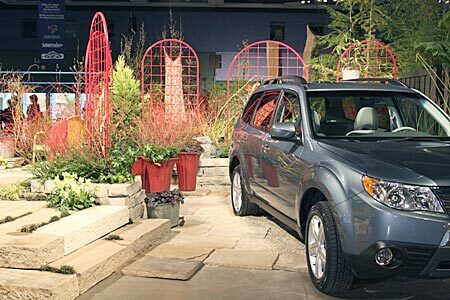 Northwest Flower and Garden Show, take me away! Take me to a horticultural fairyland where the clematis bloom in February, water features never freeze, and the tulip bulbs haven't been devoured by marauding rodents. 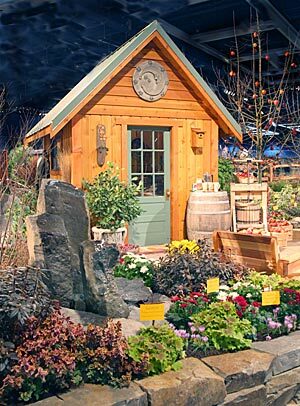 While some gardeners may be content to wait for paradise, I'll seek it out in the 26 full-scale display gardens of Seattle's granddaddy garden show, February 20-24 at the Washington State Convention Center. 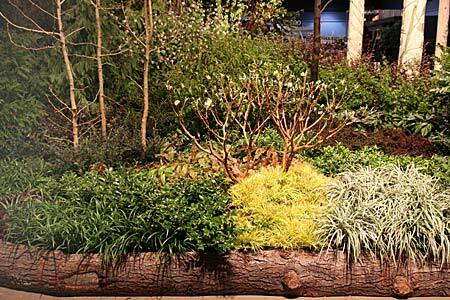 For a sampling of this year's display gardens, read on. Obviously, I'm a sucker for spring. So when I saw a display garden entitled "A Spring Day," visions of daffodils danced in my head. I think I speak for the greater part of garden show attendees when I say, "Give me vernal rapture and plenty of it." And that's just what Pamela Richards, the garden's Seattle-based designer has done. Her vision is a coup de rouge in lipstick-red tulips and primroses and pots from Aw Pottery that extend the crimson tide. 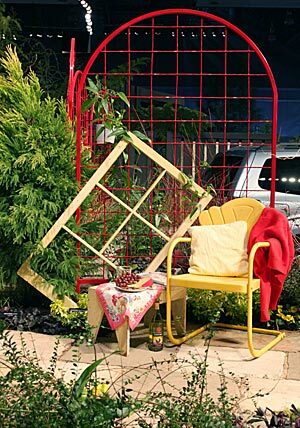 Dramatic red metal trellises, crafted by Jim Honold of Home and Garden Art in Ballard, WA, provide demarcation between the garden and a driveway that holds a Subaru Forester. Here's the story: It's a glorious, early spring Saturday morn – the lark's on the wing, the snail's on the thorn. The homeowner, let's call her Mindy, has just arrived home from a shopping trip, and the SUV has yet to be unloaded. She'll finish later; right now it's time for lunch. Mindy loves her garden. 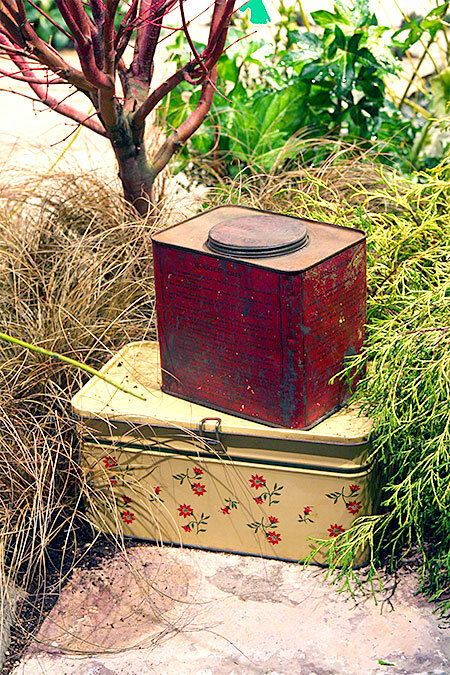 She also loves old watering cans, and her collection is scattered about the garden. The red pots are joined by a variety of recycled, galvanized buckets and washtubs, that hold daffodils, foliage plants, grasses, and one red hot coral bark Japanese maple ( Acer palmatum 'Sangokaku'). In the garden she has planted color-stemmed willows and dogwood, clematis and quince, coral bells (Heuchera hybrids) and lots of daffodils. The large path and patio are composed of green and white India sandstone, compliments of Lakeview Stone and Garden in Seattle. Mindy, however, has a life beyond the office and the garden; she has taken time out this idyllic spring day to hang a dress (guess what color) to freshen in the breeze in preparation of a night out. That's right, Mindy is planning to paint the town red. Click on image for a large version. When it comes to equinoxes, there can be no vernal without the autumnal. 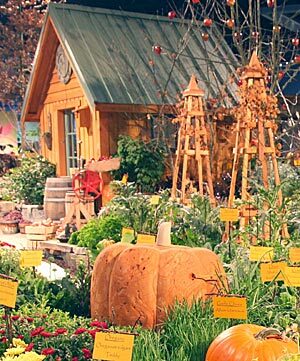 This year Pacific Stone Company of Everett, WA balances things nicely with the first ever autumn-themed display garden of the show. Although I immediately developed a crush on this harvest garden with its sly sense of humor, the name actually refers to the crushing of grapes. In their garden, co-designers and company owners Timothy Gray and Lloyd Glasscock envisioned an Arcadian microcosm of down-home family fun and food. "Two seasons have that warm and homey feel: spring and fall," states Gray. "Fall is a time of family and friends, of gathering together." The harvest moon approaches and the pumpkins have been cut from their vines. 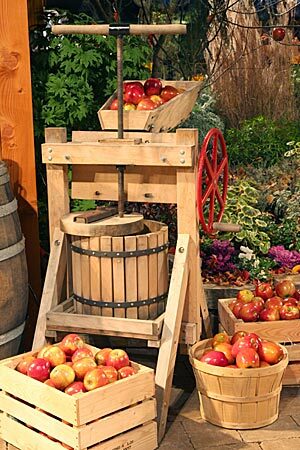 A few tardy apples cling to the branches, and cornstalks rustle in an Indian summer breeze. In the vineyard, a family gathers for a harvest potluck. On the patio, a table is laid with pitchers and wine goblets, but before the bacchanalia begins, there are grapes to pick and apples to press. This garden is a tribute to tradition, including the return of the American vegetable garden – a theme celebrated in several display gardens this year. Raised beds yield a bounty of herbs, carrots, beets, Swiss chard, onions, and green and purple kohlrabi. 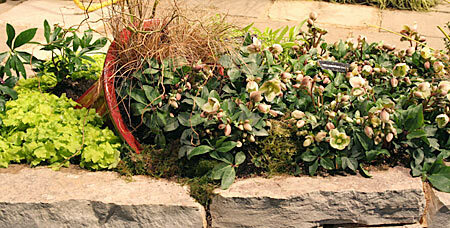 Containers hold sedums, crassula and bay laurel. 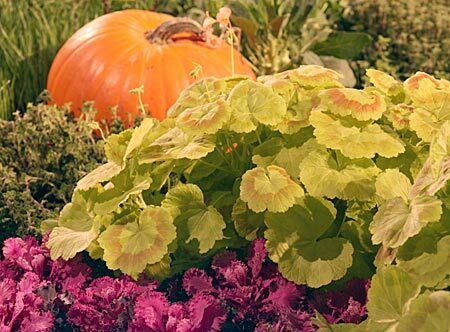 The borders are a blaze of chrysanthemums, ornamental kale, winter pansies, miscanthus, lemon-scented geraniums (pelargonium), Brunnera macrophylla ‘Looking Glass', and pin oak (Quercus palustris) with its persistent dead leaves. Seven-hundred-fifty spring crocus were specially selected to mimic autumn crocus (Colchicum sp.). A run of fine-leaved, Mexican orange, Choisya ternata ‘Aztec Pearl', provides a punch line for those with a sharp eye and sense of humor. Consider the advance planning required to coordinate this off-season cornucopia. The designers started many of the plants from seed, overwintering them in cool greenhouses at Sunnyside Nursery in Marysville, WA and Lake Washington Technical College. 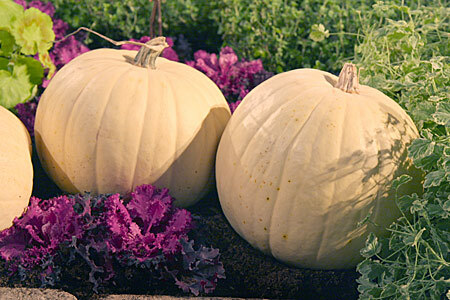 Eighteen-hundred pounds of pumpkins needed dry storage. In October, Gray collected and dried fallen oak leaves to add authenticity to the garden beds. Now that's commitment. Pacific Stone brought its forte to the fore with 64,000 pounds of handsome, high-end stone and concrete for use in patios, paths, stairs and walls. Mukilteo Cedar Products contributed the cedar furniture seen on the patio. Wine casks are everywhere, and a nearby shed holds potting benches and wine-making apparatus. Final touches include a three thousand dollar carved pumpkin and a columned water feature, which provides a "splash factor," inviting spectators to join the seasonal reveries by running their fingers through the flowing water. Raise a glass to this vintage vineyard. All in all, it's been a very good year. Click on images for a large version. Now for the educational part of our program. I don't know about you, but I learn better with visual aids. This year the Washington Park Arboretum teaches me – and other curious gardeners – a lesson with an intriguing display garden that explores the Pacific Rim provenance of some of our favorite garden plants. It also heralds the arboretum's 12-acre Pacific Connections Garden, currently under construction at the south end of the park. 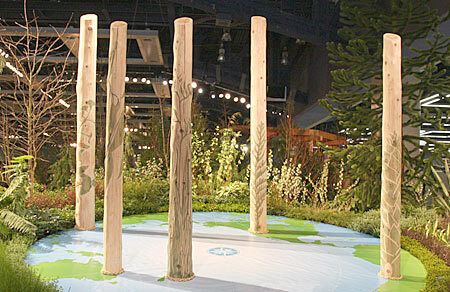 Five temperate-climate regions of the Pacific Rim--Chile, New Zealand, Australia, China, and Cascadia (that's us)--are represented by five western red cedar columns placed on a blue and green floor map. Salvaged from storm-damaged trees within the arboretum, the columns are hand-carved, each with images of plants endemic to the region it represents: monkey puzzle tree (Araucaria araucana) from Chile, New Zealand flax (Phormium sp. ), Australian eucalyptus, Ginkgo biloba from China, and western red cedar (Thuja plicata) from our own backyard. 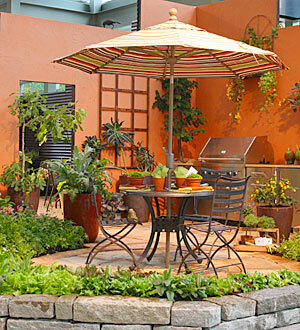 The garden was designed by Kathleen Day of the Seattle-based Portico Group. 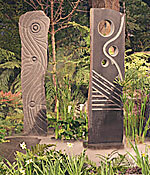 The Pomegranate Center of Issaquah designed and carved the cedar posts. A 20-foot tall monkey puzzle tree, donated from the garden of Jody Grage of Ballard, was transported to the show garden by Northwest Tree Spade. It's humbling to consider the geographic scope of modern gardening. 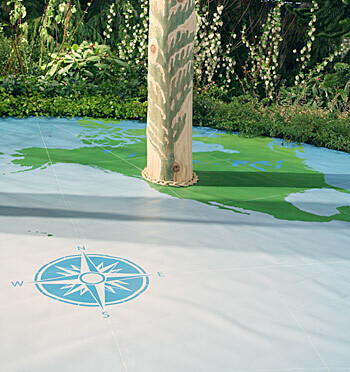 Our beds and borders are built upon a rich history of botanical evolution, exploration, and commerce. How lucky we are, here in the Pacific Northwest, to have access to, and the climate for, such a wide diversity of exotic taxa. It's eye-opening to see how global our occidental tastes truly are. A green thumbs-up to the arboretum for planting the seed of education by means of art. All photographs by Debbie Teashon.